Monitoring mission with day- and night-time operations for detection and tracking of vessels and or detection of oil spills. This type of mission requires a long endurance RPAS with LOS and BLOS capabilities. The RPAS uses its radar, optical and IR sensors to detect vessels and objects on the sea. After the information from the vessel is forwarded to EMSA, possible suspect vessels will be identified by the data analysis and immediately forwarded to EMSA/user. Potential oil spills can be detected via manual analysis or via automated algorithms on board of the RPAS. For marine pollution situations requiring day- and night-time operations, long endurance RPAS with LOS and BLOS capabilities. This service is characterised by an automatic observation pattern navigation for target tracking and identification of potential polluters, and for oil spill characterisation (size, thickness, subparts, etc.) using the appropriate sensors. RPAS services can support response operations by monitoring the evolution of the extent of the spill. To do so, communication between all the oil spill response teams (aircraft and ships) must be maintained during the operations. As a complementary task to maritime patrolling, the long range cameras on the RPAS allow for illegal activities to be detected on vessel decky. Furthermore, the RPAS speed and its high altitude allows the user to monitor and identify the behaviour on board the vessel while keeping the aircraft undetectable. After locking on the target, the RPAS can track it, as long as its endurance allows. 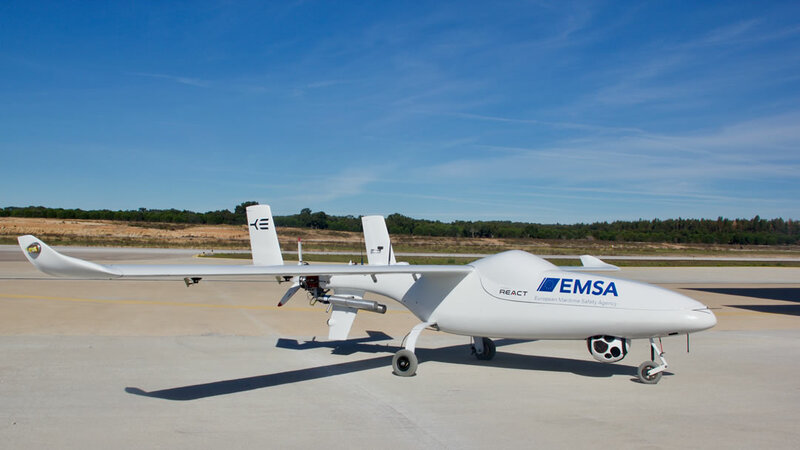 The RPAS can carry SOx sensors in order to measure the sulfur content in the plume emitted by the ship, and therefore estimate the sulfur content of the fuel burnt by the vessel. Based on the percentage of sulfur identified, this allows Member States to possibly target inspections to see if further follow-up is required. With LOS and BLOS capabilities, the aircraft operates towards vessel, life-raft or boat detection, hence the necessity of a search pattern navigation (with automatic target following and flight path adjustment to maintain the sight of the target).